As guitarists, we spend days, weeks, months, obsessing over specs, but imagine you could change your guitar’s pickups, fretboard, even its body shape in seconds. 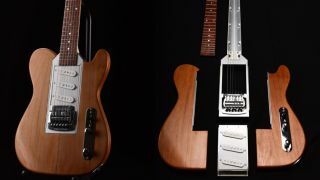 Well, imagine no more, as that’s exactly what Somnium Guitars has set out to achieve with its modular guitar concept. Somnium's individual machined components are user-interchangeable, meaning one guitar can be completely reassembled in minutes, and without even having to remove the strings. Pickups, body styles, bridges and fretboards can all be swapped over: so, you can go from rosewood to ebony, hardtail to locking vibrato and, best of all, humbuckers to single coils. The fact that the parts are detachable means you can pack the guitar up into a much shorter and more compact case, too. We got a demo of the design at NAMM, and we have to say, we were impressed, and we’ve been assured that the guitars and USA-made components will be available soon. Head over to Somnium Guitars for more info.